Well this seems like a really good idea. Death metal band Unfathomable Ruination are playing in an airtight, soundproof box in London until they run out of oxygen. The stunt is taking place outside of The Gherkin (30 St Mary Axe) in the City, with the band next due to play at 6pm this evening. 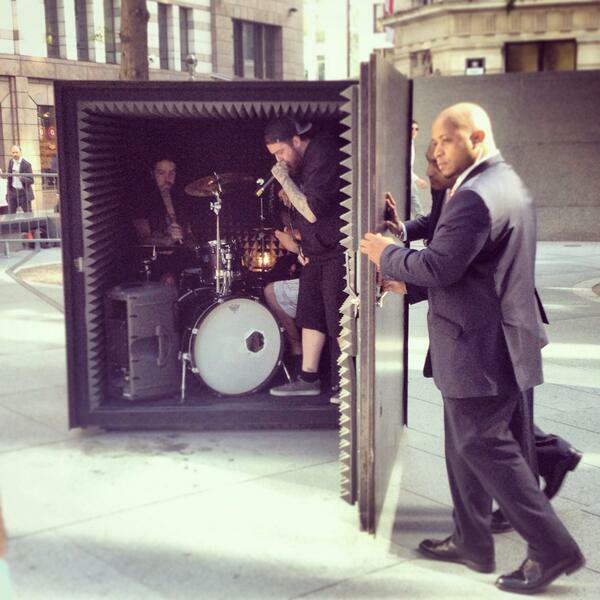 Those gathered outside the cube will hear only “strange vibrations” once the band enter the box. Unfathomable Ruination's set is part of an art installation by Portuguese artist Joao Onofre, entitled "Box Sized DIE". In each location the sculpture travels to, Onofre invites a local Death Metal band to play, on this occasion Unfathomable Ruination. The box is soundproofed, determining and restricting the performance's duration to the length of time in which the oxygen is expended. Outside the cube, viewers observe its strange vibrations, only viewing the band's entrance and exit to the performance space. Singer Ben Wright told CNN the band managed 14 minutes in the box the first time they tried it but got up to 19 minutes earlier this week. News of their performance has already spread widely, with the band posting links to the coverage on their Facebook page. "According to the medical professionals who read the Independent, we're all going to die... Challenge Accepted," the band declared. If you head on down to the installation, here's some of the music you might be able to enjoy before they shut the door. The London five-piece are playing twice on Thursday and then three times a week from Friday until August 1.